Students from Suffolk County Sheriff Vincent DeMarco’s Criminal Justice Class at Dowling College got a close up view of corrections when they toured the County’s Riverhead Jail this morning. Riverhead, NY - October 9, 2015 - Students from Suffolk County Sheriff Vincent DeMarco’s Criminal Justice Class at Dowling College got a close up view of corrections when they toured the County’s Riverhead Jail this morning. The students met with the County Sheriff in his office and then were escorted through many of the jail’s housing areas, the holding pen, internal intelligence operations, and its specialized units where correctional staff book and perform iris scans of incoming inmates. The Sheriff’s Office provides tours of the Riverhead Jail for more than a thousand high school and college students each year through its popular Youth Enlightenment Seminar (YES) initiative. The Jail also offers personal YES tours for parents to accompany their at-risk youth to give them a firsthand look at life behind bars. “These tours give students a realistic view of corrections work and, from a different perspective, what daily life is like for an inmate at the County Jail. You just can’t get this kind of understanding from a TV show or from reading a textbook,” stated DeMarco. More information about tours and other community programs may be found on the Sheriff’s Office’s website at www.suffolksheriff.com. Pictured: Sheriff Vincent F. DeMarco (right) talks with students from his Criminal Justice class at Dowling College. The students toured the Riverhead Jail on October 9, 2015. College Connection. The Cure for the Common App! 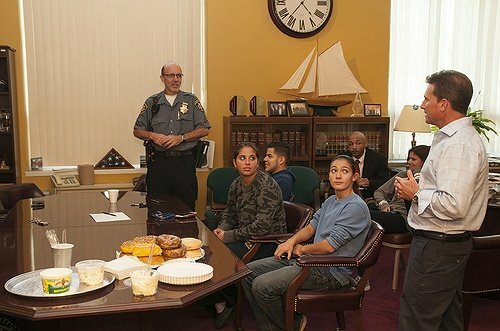 Subject: LongIsland.com - Your Name sent you Article details of "Dowling College Students Visit the Suffolk County Jail"